Next, Redford, reverend sire, came footing slow, his mantle hoary and his bonnet sedge. Why must movies based on history be so reverent? They pace along in the footsteps of history so carefully it’s as if the actors are balancing books on their heads. And they are—the historical accounts of the events depicted. The first victim in such films is pacing. The story moves solemnly from point to point until the inevitable conclusion. 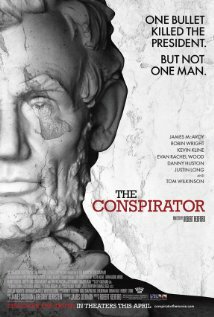 The first offering from Joe Ricketts’ American Film Company, The Conspirator is the story of Mary Surratt, convicted as a co-conspirator in the assassination of Abraham Lincoln. Apparently, the authorities couldn’t find the son, the true conspirator, so they settled for his mother. Was she an actual co-conspirator or only the owner of the boarding house where John Wilkes Booth and his cohorts (including Surratt’s son) met? The filmmakers clearly want to leave her guilt as an open question, but Robin Wright’s performance is at once so restrained and so heartfelt that it’s hard to think of her as guilty. She accepts her fate because she doesn’t want her son to die, and so she became the first woman executed in the United States. The company’s noble aim is interesting and laudable: make movies about historical people and events that are ruthlessly accurate, accurate to the point of hiring historians to vet the scripts, to the point of having historians serve as on-set advisors. It’s refreshing after the hash Hollywood usually makes of history. For instance, you may not realize that during the revolution in Argentina, there was a lot less singing than in Evita. The creative team has the right pedigree. Robert Redford is an able director who knows how to get out of the story’s and the actors’ way. And the cast is excellent: Robin Wright, James McAvoy, Kevin Kline, Tom Wilkinson, Evan Rachel Wood, Colm Meaney, Danny Huston. The only soft spot in this apple is Justin Long, who’s great when he plays Justin Long, but who looks here as though he’s not capable of growing as much facial hair as the makeup department has given him and who delivers his lines with all the verve of the most talented student in the high school drama club. But I don’t blame him. The script doesn’t give the actors enough to work with. The issue isn’t accuracy, it’s the quality of the writing. Some of the dialogue—especially in the extended courtroom scenes—is based on historical record, and it’s compelling to hear the voices of the past brought to life. But much of the rest was invented based on reasonable guesses about the characters’ experiences, motives, and feelings. It’s here where the script goes wrong. The characters make speeches instead of speaking. They don’t talk, they intone. At times, every line sounds like part of a closing argument. Stephen Root, who seems to be everywhere these days, brings the only real energy to the film. He plays John Lloyd, a witness who may or may not have been paid to give false testimony, careening from lie to lie and, when he’s called on it, reacting like a cornered dog. The true star of this movie is the setting. Filmed in Savannah for Washington City, the movie has a look so authentic that you’d swear it was shot during the events it depicts. Gaslight flickers. Dusty sunlight pours through windows. The costumes are meticulous recreations not only of clothing from the period, but of the actual clothing worn by the principals. Mary Surratt’s dress, for instance, is modeled on the actual dress Surratt wore. Though the buildings may not be the originals (Surratt’s boarding house survives, but as a Chinese restaurant), they’re from the period and they lend more authenticity to the production than any backlot re-creation. I just wish they’d spent as much money on writers as they did on locations.